Eckhart Tolle (/ˈɛkɑːrt ˈtɒlə/ EK-art TOL-ə; German pronunciation: [ˈɛkhaʁt ˈtɔlə], born Ulrich Leonard Tölle, February 16, 1948) is a spiritual teacher. He is a German-born resident of Canada best known as the author of The Power of Now and A New Earth: Awakening to Your Life's Purpose. In 2008, The New York Times called Tolle "the most popular spiritual author in the United States". In 2011, he was listed by Watkins Review as the most spiritually influential person in the world. Tolle is not identified with any particular religion, but he has been influenced by a wide range of spiritual works. Tolle said he was depressed for much of his life until age 29, when he underwent an "inner transformation". He then spent several years wandering "in a state of deep bliss" before becoming a spiritual teacher. He moved to Vancouver, British Columbia in 1995 and currently divides his time between Canada and California. He began writing his first book, The Power of Now, in 1997 and it reached The New York Times Best Seller list in 2000. The Power of Now and A New Earth sold an estimated three million and five million copies respectively in North America by 2009. In 2008, approximately 35 million people participated in a series of 10 live webinars with Tolle and television talk show host Oprah Winfrey. In 2016, Tolle was named in Oprah's SuperSoul 100 list of visionaries and influential leaders. Born Ulrich Leonard Tölle in Lünen, a small town located north of Dortmund in the Ruhr Valley, Germany in 1948, Tolle describes his childhood as unhappy, particularly his early childhood in Germany. His parents fought and eventually separated, and he felt alienated from a hostile school environment. He also experienced considerable fear and anxiety growing up in post-war Germany, where he would play in bombed-out buildings. He later stated that pain "was in the energy field of the country". At the age of 13, he moved to Spain to live with his father. His father did not insist that he attend high school, so Tolle elected to study literature, astronomy and various languages at home. At the age of 15, he read several books written by the German mystic Joseph Anton Schneiderfranken, also known as Bô Yin Râ. Tolle has said he responded "very deeply" to those books. At the age of 19, he moved to England and for three years taught German and Spanish at a London school for language studies. Troubled by "depression, anxiety and fear", he began "searching for answers" in his life. In his early twenties, he decided to pursue his search by studying philosophy, psychology, and literature, and enrolled in the University of London. After graduating, he was offered a scholarship to do postgraduate research at Cambridge University, which he entered in 1977 but dropped out soon after. I couldn’t live with myself any longer. And in this a question arose without an answer: who is the ‘I’ that cannot live with the self? What is the self? I felt drawn into a void! I didn’t know at the time that what really happened was the mind-made self, with its heaviness, its problems, that lives between the unsatisfying past and the fearful future, collapsed. It dissolved. The next morning I woke up and everything was so peaceful. The peace was there because there was no self. Just a sense of presence or "beingness," just observing and watching. Tolle recalls going out for a walk in London the next morning, and finding that "everything was miraculous, deeply peaceful. Even the traffic." The feeling continued, and he began to feel a strong underlying sense of peace in any situation. He stopped studying for his doctorate, and for a period of about two years after this he spent much of his time sitting, "in a state of deep bliss," on park benches in Russell Square, Central London, "watching the world go by." He stayed with friends, in a Buddhist monastery, or otherwise slept rough on Hampstead Heath. His family thought him "irresponsible, even insane." He changed his first name from Ulrich to Eckhart; by some reports this was in homage to the German philosopher and mystic, Meister Eckhart. A 2012 interview article states that he saw the name Eckhart on one of a pile of books in a dream, and knew he had written the book; soon after in real life he ran into a psychic friend who called him Eckhart out of nowhere, so he changed his name. After this period, former Cambridge students and people he had met by chance began to ask Tolle about his beliefs. He began working as a counselor and spiritual teacher. Students continued to come to him over the next five years. He relocated to Glastonbury, a major centre of alternative living. In 1995, after having visited the West Coast of North America several times, he settled in Vancouver, British Columbia, where he met his future wife, Kim Eng. Tolle's first book, The Power of Now, was first published in 1997 by Namaste Publishing. Only 3,000 copies were published of the first edition. He said he and his friends personally delivered some copies of the book to bookstores in Vancouver and the surrounding area. The book was republished on a large scale by New World Library in 1999. In 2000, Oprah Winfrey recommended it in her magazine, O. In August 2000, it reached The New York Times Best Seller list for Hardcover Advice. After two more years, it was number one on that list. By 2008, the book had been translated from English into 33 languages; since then, it has been translated into Arabic. He published his second book, Stillness Speaks, in 2003. In July 2011, The Power of Now appeared on the list for the 10 best selling Paperback Advice books for the 102nd time. In 2005, Tolle published his third book, A New Earth, which assumed the number one position on The New York Times Best Seller list several times between March and September 2008. By the end of 2008, it reached the list for the 46th time. The high sales of A New Earth in that year followed its selection by Oprah Winfrey for her book club in January. In the four weeks following the announcement, 3.5 million copies of the book were shipped. Tolle partnered with her to produce a series of webinar sessions beginning in May 2008. The weekly webinar sessions included discussions between Winfrey and himself, silent meditations, and questions from viewers via Skype. Each webinar focused on a specific chapter of A New Earth. The third webinar attracted more than 11 million viewers. He formed a company to sell products related to his teachings called Eckhart Teachings. He created a website called Eckhart Tolle TV, with streaming video of monthly group meditations and other videos. He gives speeches and workshops in English and occasionally in German or Spanish. He also travels for various speaking engagements, such as seminars and retreats. In a 2003 interview with the Telegraph Magazine, Tolle indicated that he had no intention of creating "a heavy commercial structure", nor of setting up an ashram or centre. He believes one "could develop organically" and said "one needs to be careful that the organization doesn’t become self-serving". In September 2009, he appeared with the Dalai Lama and other speakers at the Vancouver Peace Summit. The same year he published Guardians of Being, a picture book illustrated by Patrick McDonnell, the creator of the comic strip Mutts. In 2017 British contemporary artist Alexander de Cadenet interviewed Tolle about art and the spiritual dimension. Tolle commented on his interest in landscape photography and said "both art and nature can serve as portals into the transcendent dimension, your essence identity." In 2018 Watkins Mind Body Spirit magazine produced the first ever publications of Tolle's nature photography. A true spiritual teacher does not have anything to teach in the conventional sense of the word, does not have anything to give or add to you, such as new information, beliefs, or rules of conduct. The only function of such a teacher is to help you remove that which separates you from the truth ... The words are no more than signposts. He says that his book, The Power of Now, is "a restatement for our time of that one timeless spiritual teaching, the essence of all religions". He writes that religions "have become so overlaid with extraneous matter that their spiritual substance has become almost completely obscured", that they have become "to a large extent ... divisive rather than unifying forces" and become "themselves part of the insanity". Tolle writes that "the most significant thing that can happen to a human being [is] the separation process of thinking and awareness" and that awareness is "the space in which thoughts exist". Tolle says that "the primary cause of unhappiness is never the situation but your thoughts about it". According to his official website, "at the core of Tolle's teachings lies the transformation of consciousness, a spiritual awakening that he sees as the next step in human evolution. An essential aspect of this awakening consists in transcending our ego-based state of consciousness. This is a prerequisite not only for personal happiness but also for the ending of violent conflict endemic on our planet". In his book A New Earth, he describes a major aspect of the human dysfunction as "ego" or an "illusory sense of self" based on unconscious identification with one's memories and thoughts, and another major aspect he calls "pain-body" or "an accumulation of old emotional pain". He often talks about the relevance of figures in intellectual or popular culture. In A New Earth, he quotes René Descartes, Jean-Paul Sartre, Friedrich Nietzsche, William Shakespeare and Albert Einstein. He has spoken of movies such as Groundhog Day, American Beauty, The Horse Whisperer, Gran Torino, Titanic, Avatar, Being There, and Forrest Gump, and musicians such as Wolfgang Amadeus Mozart, The Beatles and The Rolling Stones. He arranged an album of music in 2008 entitled Music to Quiet the Mind including work composed by Erik Satie, Claude Debussy and The Beatles, and music by contemporary artists such as Deva Premal, Jeff Johnson, and Steve Roach. According to a 2009 article in The New York Times, Tolle is "not identified with any religion, but uses teachings from Zen Buddhism, Sufism, Hinduism and the Bible". He has said: "I feel actually that the work I do is a coming together of the teaching 'stream', if you want to call it that, of [Jiddu] Krishnamurti and Ramana Maharshi." Tolle has mentioned texts such as the Tao Te Ching, the Bhagavad Gita and other Hindu texts, the Buddhist texts, the Old Testament, the New Testament, and A Course in Miracles; he has mentioned various individuals such as Zoroaster, Laozi, Mahavira, Gautama Buddha, Heraclitus, Parmenides, Jesus, Epictetus, Marcus Aurelius, Rumi, Meister Eckhart, Hafiz, Linji Yixuan, Ralph Waldo Emerson, and Carl Jung; and he has emphasized the mystical schools within religions such as Gnosticism in Christianity, Sufism in Islam, Hasidism and Kabbalah in Judaism, Advaita Vedanta in Hinduism, and Zen and Dzogchen in Buddhism. In 2008, an article in The New York Times referred to him as "the most popular spiritual author in the [United States]". In 2011, the Watkins Review put him at number 1 in a list of "The 100 Most Spiritually Influential Living People". By 2009, total sales of The Power of Now and A New Earth in North America had been estimated at three million and five million copies respectively. The books have received a wide range of praise and criticism. One book reviewer characterized The Power of Now as "awash in spiritual mumbo-jumbo", while another reviewer wrote, "Tolle's clear writing and the obvious depth of his experience and insight set it apart". Some critics characterize his books as unoriginal or derivative. A 2009 The New York Times article said he is "hardly the first writer to tap into the American longing for meaning and success". Sara Nelson, the editor-in-chief of Publishers Weekly, said Tolle's writings have been successful due to surging public interest in books that tell you how to be happier, more peaceful and more successful. James Robinson in The Observer called his writings "a mix of pseudo-science, New Age philosophy, and teaching borrowed from established religions". However, others praise his re-working and synthesis of traditions. New Age writer William Bloom wrote that "Tolle is offering a very contemporary synthesis of Eastern spiritual teaching, which is normally so clothed in arcane language that it is incomprehensible", thereby providing "a valuable perspective on Western culture". Publisher Judith Kendra says, "The ideas [that Tolle is] talking about have been in existence for thousands of years in both Eastern texts and with the great Western mystics, but he's able to make them understandable". Musician Annie Lennox said he "has some kind of special quality that I've never encountered before". Christian scholars have differing opinions on the compatibility of Tolle's ideas with Christianity. 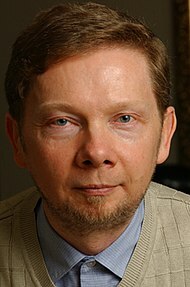 James Beverley, professor of Christian Thought and Ethics at the evangelical Tyndale Seminary in Toronto, says that Tolle's worldview "is at odds with central Christian convictions" and that "Tolle denies the core of Christianity by claiming there is no ultimate distinction between humans and God and Jesus". John Stackhouse, a professor of theology and culture at evangelical Regent College in Vancouver, says that he "gives a certain segment of the population exactly what they want: a sort of supreme religion that purports to draw from all sorts of lesser, that is, established religions". Stackhouse has described him as one of several spiritual teachers who "purport to have investigated the world’s religions (quite a claim) and found them wanting, who routinely subject those religions to withering criticism, and who then champion their own views as superior to all these alternatives". Conversely, Stafford Betty, teacher for Religious Studies at California State University, Bakersfield finds common ground between Tolle's worldview and that of Christian mystics. He notes that "one of the key elements in Tolle's teaching is that deep within the mind is absolute stillness in which one can experience 'the joy of Being'". Roman Catholic priest and theologian Richard Rohr credits Tolle for helping to reintroduce ancient Christian mysticism to modern Christians: "Tolle is, in fact, rather brilliantly bringing to our awareness the older tradition ... [which is] both the ground and the process for breaking through to the theological contemplation of God, and acquired contemplation of Jesus, the Gospels, and all spiritual things." In 2008 The Independent noted that "Tolle's theories are certainly seen by many as profoundly non-Christian, even though Tolle often quotes from the Bible," but that "Tolle does have fans in academic, even Christian, circles". It cited Andrew Ryder, a theologian at All Hallows College in Dublin, who wrote, "While he may not use the language of traditional Christian spirituality, Tolle is very much concerned that, as we make our way through the ordinary events of the day, we keep in touch with the deepest source of our being." ^ "About Eckhart Tolle". Eckhart Teachings. ^ "Eckhart Tolle - The Energies Around You". ^ a b c d e f g McKinley, Jesse (2008-03-23). "The Wisdom of the Ages, for Now Anyway". The New York Times. Retrieved 2009-10-19. ^ a b "The Watkins Review Announces Its Spiritual 100 List". Marketwire.com. 2011-03-29. Archived from the original on December 26, 2011. ^ a b c d e f g h i j Eckhart Tolle Biography. The New York Times (2008-03-05). Times Topics. ^ About Eckhart Tolle. EckhartTolle.com. Retrieved March 24, 2015. ^ a b c d e f Tolle, Eckhart (2005). The Power of Now (2005 edition). Hodder and Stoughton Ltd. ISBN 978-0-340-73350-9. ^ a b Best Sellers. The New York Times (2000-08-12). Hardcover advice. Retrieved 2010-06-04. ^ a b c d e f g h i j k Ken MacQueen (2009-10-22). "Eckhart Tolle vs. God". Macleans.ca. Retrieved 2009-10-24. ^ a b c d e f g h i j k l Ether Walker (2008-06-21). "Eckhart Tolle: This man could change your life". The Independent. ^ Ruhr Nachrichten (2008-05-27). Amerikas Guru stammt aus Lünen ('America’s guru comes from Lünen'). Retrieved 2010-06-03. ^ a b c d e f g h i j k l Dialogues With Emerging Spiritual Teachers, by John W. Parker Sagewood Press, 2000. ^ Douglas Todd (2002-10-05). Profile: Eckhart Tolle – of the present, future and mother. The Vancouver Sun. Retrieved on 2016-04-21. ^ a b c d e Claire Scobie (2003-08-31). Why now is bliss. Telegraph Magazine. Retrieved on 2010-02-02. ^ a b c d e Cathy Lynn Grossman (2010-15-04). 'Life's Purpose' author Eckhart Tolle is serene, critics less so. USA Today. Retrieved 2010-05-24. ^ "EXCLUSIVE INTERVIEW with Eckhart Tolle | PositiveLife.ie | Positive Life Magazine". PositiveLife.ie. Retrieved 2012-09-08. ^ a b c d Eckhart Tolle Biography. Eckhart Tolle's official website. Retrieved 2009-10-22. ^ Douglas Todd's backstage report from the Vancouver Peace Summit. The Vancouver Sun (2009-09-27). Retrieved on 2010-03-12. ^ Best Sellers. The New York Times (2003-01-12). Hardcover advice. Retrieved 2010-06-04. ^ "KALIMA publishes Eckhart Tolle's 'A New Earth and the Power of Now' in Arabic as well". WAM: Emirates News Agency. 2010-04-01. Archived from the original on 2011-07-21. Retrieved 2010-05-24. ^ a b Tolle, Eckhart (2003). Stillness Speaks. New World Library. ISBN 978-1-57731-400-4. ^ Best Sellers. The New York Times (2011-07-17). Paperback advice. Retrieved 2011-07-19. ^ a b c Tolle, Eckhart (2005). A New Earth. Penguin Books. ISBN 978-0-14-103941-1. ^ Best Sellers. The New York Times (2008-03-02). Paperback Advice. Retrieved 2010-05-24. ^ Best Sellers, The New York Times (2008-03-02). Paperback Advice. Retrieved 2010-09-07. ^ Best Sellers. The New York Times (2008-12-19). Paperback Advice. Retrieved 2010-06-04. ^ a b Oprah Winfrey Book Pick 'A New Earth' Shatters Records. Associated Press via Fox News (2008-02-28). Retrieved 2010-05-24. ^ About Eckhart Teachings. Eckhart Tolle's official website. Retrieved 2009-10-22. ^ a b "Eckhart Tolle Australian TV Interview". Today Tonight, Seven Network (2009). ^ Douglas Todd (2009-09-28). Dalai Lama in Vancouver : Pursuit of peace and compassion a complex path. Vancouver Sun. Retrieved 2010-05-24. ^ The history of the Dalai Lama Center for Peace and Education. Official website. Retrieved 2010-06-04. ^ "Eckhart Tolle Books: Guardians of Being". Eckhart Tolle's official website. Retrieved 2009-10-15. ^ "Watkins Mind Body Spirit Issue 50". Issuu. Retrieved 2018-11-30. ^ "Eckhart Tolle's Photographs of Nature | Awakened Artists". Awakened Artists. Retrieved 2018-11-30. ^ James Rainey (2009-06-05). Jim Carrey and friends opt for consciousness-raising over Lakers. Los Angeles Times. Retrieved 2010-06-22. ^ Eckhart Tolle (2006). Findhorn Retreat: Stillness Amidst The World. New World Library. ISBN 1-57731-509-X. ^ "Music to Quiet the Mind". eckharttolletv.com. Retrieved 21 July 2015. ^ "Music to Quiet the Mind - track listing". allmusic.com. Retrieved 21 July 2015. ^ Eckhart Tolle Free TV. Eckhart Tolle's official website. Retrieved 2010-06-04. ^ "100 Spiritual Power List by Watkins, 2011 | Esoteric News". Watkinsbooks.com. Archived from the original on December 27, 2011. ^ Andrea Sachs (2003-04-21). Channeling Ram Dass. Time magazine. Retrieved 2010-05-24. ^ Phipps, Carter (2000). Time is the Enemy Archived 2010-05-15 at the Wayback Machine. Enlightenment Next magazine. Retrieved 2010-06-04. ^ James Robinson (2008-03-09). Penguin borne aloft by the power of Oprah's persuasion. The Observer. Retrieved on 2010-11-27. ^ "Eckhart Tolle: Does the Mask of "Stresslessness" Hide a Deep, Bitter Anger?". Retrieved 2013-07-28. ^ Rohr, Richard. "Eckhart Tolle and the Christian Tradition". EckhartTolle.com. Retrieved November 17, 2016.